The original Fuji X-T1 uses firmware version 1.0 or, more recently version 1.1. 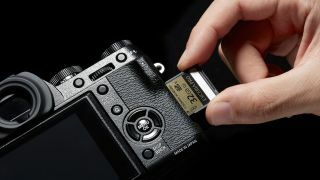 The new X-T1 Graphite comes with firmware version 2.0 which brings additional features, such as a high-speed electronic shutter, but this is not available to owners of the original X-T1. But firmware version 3.0, now available, extends the features in the X-T1 graphite and also applies all the new features retrospectively to the original X-T1. The new Fuji X-T1 Graphite includes some of the v3.0 features but not all of them. You can download the X-T1 firmware update from the Fujifilm Support page, where you'll also find instructions on how to install it. The camera's 'firmware' is like its operating system, controlling camera functions and image processing. Most camera firmware updates are relatively minor, designed to fix bugs, improve controls or, occasionally, add features. Fuji's X-T1 firmware update 3.0 is unusual in the size and scope of the update. In fact Fuji quotes no fewer than 27 enhancements or additions. Some of these are relatively minor, though, so we've whittled these down to our top 10. If you've got an older (non Graphite) X-T1, you can still bring your camera bang up to date. Natural Live View function: Normally, the X-T1 will display images as they will be captured, with any Film Simulations or effects applied. The Natural Live View function switches these off to provide a real-life view that can make shadow detail easier to see, for example, and is closer to the kind of view you get with a DSLR's optical viewfinder. AF/MF function: This provides seamless manual focus override – you can half-press the shutter button to autofocus normally, then make manual adjustments with the focus ring on the lens. Q.Menu customization: This menu offers quick access to common settings, and now you can choose which settings appear. 50p, 25p, 24p video frame rates: These are added to the existing 60p and 30p frame rates. The 50p and 25p frame rates will be especially useful in PAL video regions, while the 24p frame rate gives a 'cinematic' look. Manual video controls: You'll be able to set the ISO before you start shooting and adjust lens aperture and shutter speed while filming. Expanded Program Shift mode: Previously, the longest shutter speed in Program Shift mode was 1/4sec, but this has been extended to 4sec. Software Lock: A new option that can be used to prevent accidental button presses from changing the camera settings while you're shooting.